Schooling from the heart: What is it? While he hasn't caught any more birds, there is an obvious downside to covering our cat in bells. His hunting skills have been demoted to catching things that hardly move at all. Today he sauntered in and dropped this strange thing at my feet. I had never seen anything like it before. Apparently, neither had he; the look on his face was priceless. What is it mom? Why does my tongue feel so funny? After he dropped it, he shook his head from side to side and made the most awful faces I have ever seen a cat make. If he could have spit, I'm sure he would have. I didn't know whether he just got his mouth pricked by the hairs or if the thing had secreted poisonous juices, but I promptly examined his catch and set out to do a bit of sleuthing just in case. 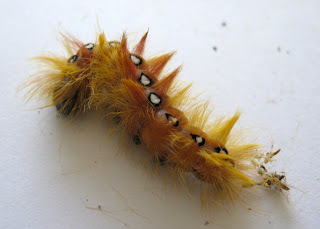 It's a Sycamore moth caterpillar (Acronicta aceris). Not poisonous. But it sure is fun to look at. The kids think so, too. Aren't search terms funny?! People also find my blog when searching something about freaky children.... lol. I'm just trying to picture your cat. He is insatiable! That is funny that he would bring you this. Great color! He's a funny cat, just a big baby really. I couldn't help thinking this caterpillar was a great color for Michaelmas. I love how fiery it is. I thought that might be the case, too. He seemed a bit worried-- more so than when he got stung by a bee as he was trying to eat it. Our kitty is definitely not a one-time learner. Oh my goodness, he tried to eat a bee?! It's not really funny...not for kitty nor the bee...but the image of it made me laugh! The caterpillar matches our "Schultüte" and Veronika's dress!